Arriving via StumbleUpon? Why not subscribe to the blog or leave a comment if this article helped? Update: Updated on February 29th 2008 with latest versions of firmware (1.2.2 version at time of press). See main site here. Firmware for your video iPod (5G Version or 5.5G Version). Iâ€™m on the 5G version, no search feature and itâ€™s the 60GB model. If youâ€™re on the slim 30gb / 80gb model and/or have the search feature then itâ€™s likely youâ€™re a 5.5G model but be sure! See my warning note below. Connect iPod to PC (iPod Wizard is windows based). If iTunes opens on connecting, youâ€™ll need to close it and make sure that nothing else is accessing your iPod at the time. If connected properly, you will see the â€˜Do Not Disconnectâ€™ warning on your iPod screen. Open up your copy of iPod Wizard (it doesnâ€™t require installation, but does need to be unzipped to a folder). Browse (via My Computer) to your downloaded firmware and if zipped, unzip it to a new folder. Unzipping should create a folder called â€˜Classic Firmware for 5G v1.0â€™ (depending on what firmware version you downloaded). 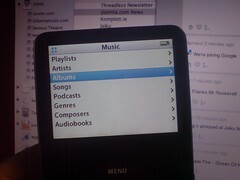 In iPod Wizard, set your edit mode (top left corner) to â€˜Firmware Fileâ€™. Click the â€˜Open Firmwareâ€™ button and navigate to your â€˜Classic Firmwareâ€¦â€™ folder and open the â€˜Classic Firmwareâ€¦â€™ file (Windows displays the default icon if no filetype associated). Once loaded, the firmwareâ€™s version name will appear beside the â€˜open firmware buttonâ€™. 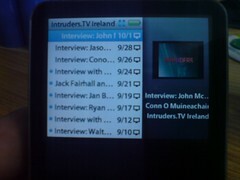 In the â€˜Firmware Informationâ€™ box, press â€˜Write To iPodâ€™ (top left). The writing process may take 2-3 minutes. When finished, you need to eject your iPod safely from your computer â€“ whether via the â€˜Safely Remove Hardwareâ€™ icon in your system tray of via My Computer (right click on your iPod and press â€˜Ejectâ€™. Ejecting the iPod will restart the iPod automatically, booting with the new firmware. 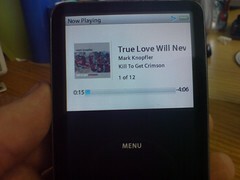 I hadnâ€™t seen the interface on the iPod classic before today but really like the split screen approach. I donâ€™t feel anything is lost by adding the firmware. Navigating through the menu system is quick, though the slide from left to right could be a lot smoother (or instant). The new fonts are bigger, smoother, clearer though the fonts in the title bar look a fraction distorted (menus are fine). I also realised through the new interface that I really need to update my album artwork across the majority of recent additions to my iPod. 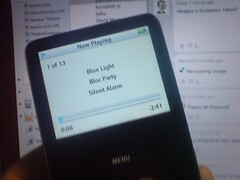 Also, it’s worth going through the iPodWizard forums if you’re up for a bit of hacking! 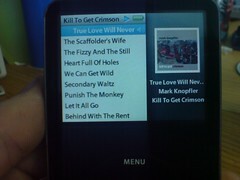 Adding this firmware does not erase the contents on your iPod. BUT – make sure you’re using the correct firmware version for your iPod. 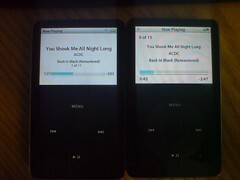 The wrong firmware on your iPod will leave it in the infinite loop mode (as I did with Aidan’s). To get around this you need to restore your iPod to it’s original settings, effectively wiping whatever music is on your iPod. Resyncing with your library will restore your music. To restore your iPod you must hold the middle button (centre of wheel) and ‘Play’ at the same time, forcing the iPod into Disk Mode (like safe mode for all the world). Reconnect your iPod to your computer and pop open iTunes, the iTunes software automatically recognising the iPod needs to be restored. The restoration process takes 1-2 minutes. iTunes To Go DRM Free?